Golf is an expensive hobby, but it’s possible to play frugal golf. I mostly gave up on playing anymore when I started my how to get out of debt plan. However, I miss the game and decided that cutting out something I enjoy to save money isn’t always a wise thing to do (assuming it wasn’t financially impossible for me to keep playing, which it wasn’t). So I started playing again, but I’m doing so with a budget and I’m making an effort to stretch my golf dollars farther than before. If you’re interested in the details, I’m starting with a budget of $50 per month. This is enough for about 2-3 (inexpensive) rounds and some practice time. According to Dr. Bob Rotella, “If you’re not spending 70 percent of your practice time on shots from 120 yards in, you’re not trying to become the best golfer you can be.” [Golf is Not a Game of Perfect , pg 88]. Not only will more short game practice save you money, but it’s the best way to improve your scoring. During any normal round you’re going to come across lost balls. If I’m certain no one around has played the ball and it’s not badly damaged I’ll pick up as many as I can. I don’t generally use these balls to play, but I save them for the shag bag and use them on the practice greens. This is a great way to keep your supply of practice balls without spending extra money. I used to think ball retrievers were a bit silly, but with many balls costing $3 – $4 each, it can quickly pay for itself. The best part is, a ball lost in the water may have only been hit once so you’ll often find balls that are essentially brand new. I also find that the golfers playing the most expensive balls are the least likely to bother to retrieve them from a lake. 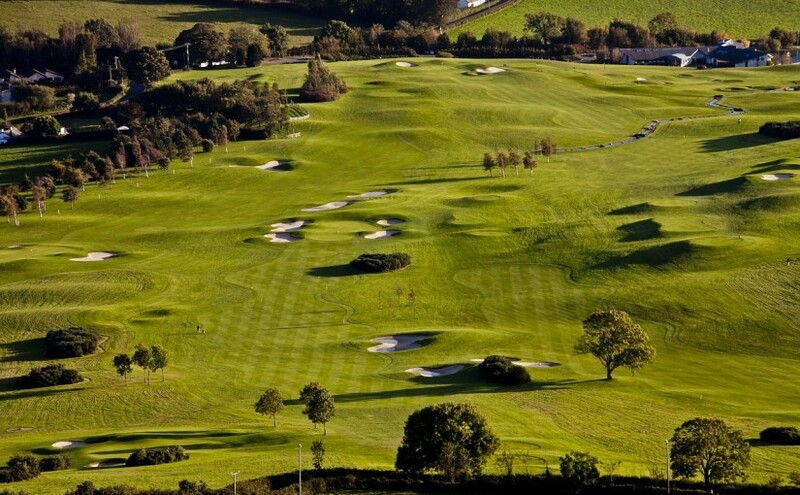 The better the course you play, the higher quality you’ll tend to find. Check for tee times on GolfNow.com, but give the course a call too. Golf Now is sort of like an Expedia or Travelocity for golf. It acts as the middleman helping golf courses sell open tee times and you benefit by getting a reduced rate. I find rates are almost always cheaper on Golf Now, but not 100% of the time. To be really sure you’re getting the best deal, you might want to give the course a call before you book on Golf Now. In summary, don’t make the mistake that I made and give up on golf (or whatever your favorite hobby may be) because of the cost, if it’s something you truly enjoy. It’s possible to find a middle ground and approach your hobby in a wise and frugal manner. Value can be found, you just have to work a little harder to find it. In the end, I’m much happier to be out playing frugal golf within my budget. I’m happy to report I finally get to try BankSimple, now just called Simple. I signed up for an invite back in March of 2010 and received one about two weeks ago (I believe they started the invite process near the end of 2011). Technically, Simple is not a bank — Simple partners with banks and becomes the friendly layer of customer service in between (we hope). While there is a distinction, for me as an end user it doesn’t really matter much. Simple has yet to roll out all planned features, but I’m happy with what I’ve seen so far. I transferred a small amount of money to my account to give Simple a try. The transfer time was in line with what I’m used to with other banks. A few days later I received my Visa debit card in the mail. The packaging was nice — definitely had a human touch — and it reminded me a bit of FieldNotes brand packaging. So far I’ve only used my card for a few small transactions around town and everything has gone smoothly. 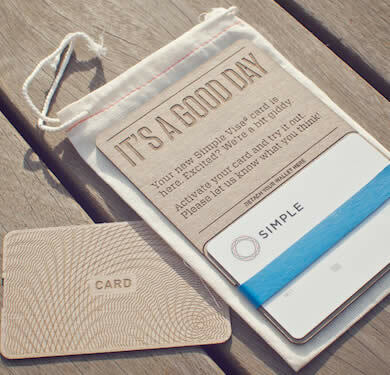 I’m primarily using the iPhone App to manage my account, and of course you can do it all on Simple’s website too. Speaking of websites, I use Mint to manage my money. Unfortunately, Simple is not yet integrated with Mint. I added the account, but Mint says it’s in BETA and currently being worked on. That’s unfortunate, but I’m hopeful it won’t be long until it’s available. As for the features still to come, there will be an Android app but that’s not out yet. Same for joint accounts and mobile check deposit. If all continues to go well — and mobile check deposit works as expected — I just might make this my primary bank. At the very least, I expect Simple to replace the other ‘online’ banks I use. Debt is Slavery: and 9 Other Things I Wish My Dad Had Taught Me About Money , by Michael Mihalik. This book is short, to the point, and packed with lots of great advice. I’ve read it three times and I would put this in my top five personal finance books, possibly at number one. I think for someone just getting started with figuring out their debt and finances this is probably the first book to read. It’s short enough to get through very quickly and find some immediate advice and inspiration to get your finances under control. The book offers this definition of slavery: “The state of being bound in servitude as an instrument of labor” [pg. 23]. Do you ever wake up in the morning and not want to go to work that day? Do you go anyway? Do you go because you really love your job that much or do you go because you owe money to someone (probably many people) and even though you may have a choice of how you’ll earn your money, ultimately you have no choice but to go to work and get that money. Lately, I’ve been dreading Monday mornings as early as Saturday night. I feel trapped and bound to this service by my debts. “Too many people hate their jobs but are afraid to leave, because they wouldn’t be able to pay their mortgage, credit card bills, car loans, or boat loans. Debt can turn a free, happy person into a bitter human being. Debt can turn you into a slave.” [pg 25]. It’s possible for debt to be good, but debt is still slavery. A mortgage can usually be thought of as good debt, but you still must make sure you can afford the mortgage you are signing up for. When we spend money, we are really trading our time for the things we buy. We make this even worse when we go into debt to buy things. We are now committing our time in the future to work to earn money to pay for the things we bought in the past. This becomes even more painful if you don’t like your job. ‘Stuff’ ads busywork and stress to our lives. So much stuff we buy we don’t even need. Eliminating unwanted stuff from our lives is an important part of getting control of our finances and getting out of debt. Experiences are more valuable than stuff. Don’t find happiness only in buying things. You won’t look back on your life when you’re older and fondly remember the stuff you accumulated. It will be easier to stop buying stuff if we avoid advertising and understand that we are constantly being marketed to and a lot of money is being spent to convince us to buy things. Make a goal of saving 50% of your income. If you do this, you would have the ability to take a month off from work for every month you work (assuming you’re earning an income from a job and not passive sources). Don’t spend more money when you get a raise. If you keep your expenses the same as before, you can increase your savings exponentially, even as your income may not be increasing at such a high rate. Money doesn’t buy happiness, it buys freedom. This is my greatest motivator for making more money and getting out of debt right now. I want to be free again. This book is packed with solid advice, expertly fit into a short, easy to read format. If you’re just getting started with fixing a financial mess in your life, I would buy this book immediately. If you need a little extra motivation and a better understanding of the mistakes of the ‘normal’ American way when it comes to money and work, read this book. I had planned to give away my copy after reading it, but I decided this is one I want to keep on my bookshelf so I have it available to read again when I see bad habits creeping back into my life. My financial turnaround began when I realized I was spending more than I earned each and every month. That’s pretty much the only way you can pile up more than $25,000 of credit card debt in a year (that’s about the rate I was going). For me, it came down to stupidity and lack of attention really. If that sounds like you right now, here are four things you can do TODAY to stop the bleeding and begin to gain control of your financial life. Stop using credit cards – Those little plastic jerks are ruining your life and you know it. Chop ’em up! They aren’t cool, you don’t NEED them, and what good have they done for you so far? Life is possible without credit cards. I haven’t had one for more than a year now and I never miss them. Make a budget – Honestly, making a budget is like getting a raise. It’s amazing what a little detail work can do for your finances. It’s hard work though. It takes time and practice to successfully budget. Don’t give up after your first try and don’t expect to get it right in the beginning. Just trust that it will work and give it a chance. This step alone will dramatically change your financial life. Sell some of the stuff you bought that you knew couldn’t afford anyway – Video games, DVDs, golf clubs, whatever unnecessary junk you bought that you don’t need. Face it, almost nothing that we buy is truly a NEED. Be ruthless. Start listing some stuff on Craigslist or Ebay. It can be a pain, but consider the hassle to be part of your therapy. This will put some cash in your pocket quickly and give you some small victories on the road to turning your cash flow positive again. Create more income – This could be overtime at your current job, finding a part-time job, or my personal favorite- finding some freelance work of some kind. Anything that allows you to use your existing skills to provide a valuable service for someone is your best bet for some quick side money. This is the best choice because you’ll start to get a taste of how to create your own path to income in your life. These are just a few tips and there is more you can do, but you have to start somewhere and this is as good a start as any. You need to dedicate extra time to working right now, but don’t neglect education. Read some blogs, and read some books. Start talking to your friends and see if any of them are trying to change their financial lives too (you might be surprised, this is more common than you probably think). Try listening to the free Dave Ramsey Show podcast (or his radio show if it’s on in your area). The podcast is only 40 minutes long, it’s free, and it’s a great way to get a daily boost of inspiration and keep fighting the battle with debt. Even if you can only do one thing today, it’s a start (if I had to pick one, I’d start with budgeting). The most important part is realizing there is a problem and starting to take action as soon as possible. Once you get the ball rolling, this will get easier. Good luck! J.D. at Get Rich Slowly recently published an interesting article on lazy money mistakes. I’ve made several of the lazy money mistakes he writes about and one in particular just about a month ago that really bugs me. I foolishly sent in a student loan payment late and lost a 1% interest rate reduction. There is no way to explain this other than pure stupidity and laziness. I had the money in my checking account to make the payment early. I had a reminder set on my computer, as I do for all of my bills. All I had to do was write a check, put it in an envelope, and mail it. I had never been late with a payment before (as evidenced by the interest rate reduction I suppose), but life just got busy and I lost focus on my finances long enough to miss this payment. That cost me a small late fee and probably a fair amount of money in extra interest over the life of the loan. It seemed that I had everything in place to keep making this payment on time, yet I still failed. Apparently, automation really is one of the most important things you can do to manage your money well. David Bach writes about this in-depth in the The Automatic Millionaire . I have to admit that I never really fully bought into the importance of automation before, but I think I’m sold on it now. Of course, this particular student loan company doesn’t offer automatic payments and I have to mail in a payment coupon along with a paper check. When automation isn’t an option, I guess you have to be extra careful to make payments early and hope that the non-automated business will get caught up with technology some day. A secondary reminder system would probably have helped too. As would have writing out the checks and stuffing the envelopes ahead of time so that all I had to do was toss it in the mailbox. Oh well, nothing to do now but chalk another one up to stupid tax and move on. What about you? Do you have any lazy money mistakes or tips for preventing them in the first place?